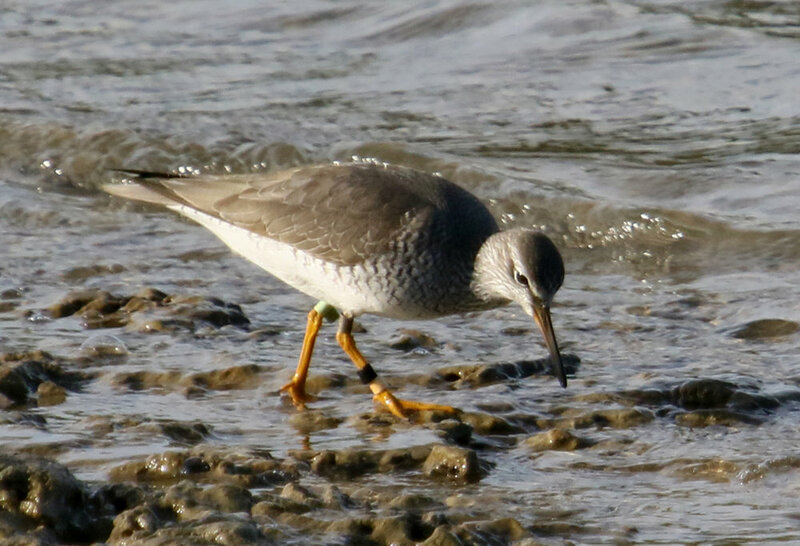 For your interest – a few days ago Lois Wooding reported a sighting of a Grey-tailed tattler with a lime green flag from Lemon Tree Passage, near Port Stephens, NSW (a record shot is attached). Lime green is the colour code associated with Southern Chukotka, far eastern Russia. Since 2010, Pavel Tomkovich and his team have been banding and flagging breeding Grey-tailed tattlers near Meynypilgyno, as settlement overlooking the Bering Sea. The bird in question was banded as a chick during their studies, with the re-sighting distance at approximately 10829 km from the banding location. Tattlers being only medium-sized shorebirds, the actual travel distance is probably in the order of 12-13,000 km as crossing the Pacific in one go is not really physically feasible for this species. There are only 34 observations of Chukotka birds in the AWSG database, with this being only the 5th Tattler, so every sighting is worth its weight in gold. Two adult birds (individually identifiable as unique colour band combinations are used for adults) have been seen in coastal NSW in the past couple of years as well.